There aren't enough food, service, value or atmosphere ratings for Panda Express, California yet. Be one of the first to write a review! firecracker chicken breast is a classic dish inspired by the sichuan province. it starts with marinated, all-white meat chicken breast, sweet red and yellow bell peppers, and crisp onions tossed in a sizzling hot wok with the perfect amount of spicy black bean sauce. orange chicken is a dish inspired by the hunan province in south central china. it is prepared with crispy boneless chicken bites, tossed in the wok with our secret sweet and spicy orange sauce. panda's very own executive chef andy brought this entree to life and it quickly became panda's most beloved dish. shanghai angus steak features thick-cut slices of marinated angus top sirloin with crisp asparagus, freshly sliced mushrooms, all wok-tossed in our new zesty asian steak sauce. beijing beef is a sichuan-style dish inspired by central china. it is prepared with crispy strips of marinated beef, bell peppers and sliced onions, tossed in the wok with a tangy sweet and spicy sauce. This Panda Express is always busy... always clean and somewhat slow. The food is great! I always get the the chowmien with orange chicken, walnut shrimp and teriyaki chicken to go... yum! Good food. Service was great. Place was clean. Food fresh, they greeted you in a professional manner. Enjoyed dining in. Panda is a good place to pick up pretty good aisian food for take out. There are several dishes we like to order when we don't like to cook. Teriyaki chicken, prawns and walnuts, fresh vegetables. LOVE their Honey Walnut Shrimp!!! I get a side entry of it and the cream cheese rangoon....YUMMMMMM! I have always craved a great Black Bean Chicken and these guys have my choice of favorite. I eagerly ate the dish without rice, I also had a side of the eggdrop soup which was pretty good. Service was quick and friendly, food was OK but far too sweetened for my taste. It was fine but I had some concerns about the calorie count. 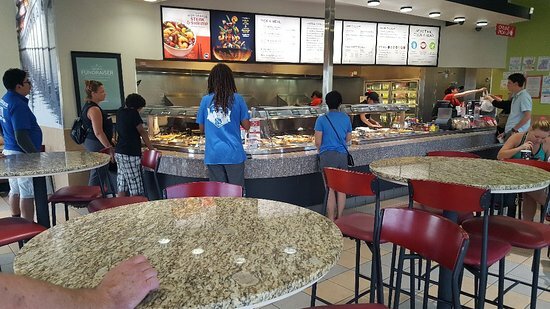 Get quick answers from Panda Express staff and past visitors.